The working philosophy of Orthopaedic Consultant Joyti Saksena encompasses several different key aspects of medicine. These include a focus on the importance of preventing as well as repairing joint damage, preserving rather than replacing joints when possible, an emphasis on working towards improving the experience of patients who undergo joint surgery, and a firm belief in the value of continuing education and training. In service of this philosophy, Mr. Saksena performs procedures that help prevent damage to the hip and knee joints, as well as those that replace joints that are beyond repair. His research interests focus on improving the outcome of the surgical procedures he performs, and on improving the patient experience both before and after surgery. 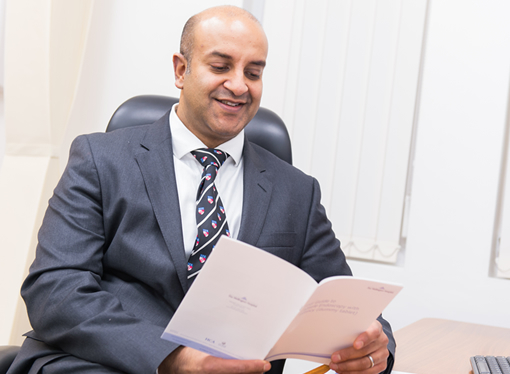 He has a particularly keen interest in performing procedures that prevent hip and knee damage in young patients, with the objective of preserving the joints to avoid the need for replacement. Another core aspect of Mr. Saksena's philosophy is the importance of education, for himself as well as for the next generation of orthopaedic surgeons. In keeping with this, he serves as an educational director at Barnet & Chase Farm Hospitals, in which he oversees post-graduate medical training for hundreds of new doctors. He also devotes time to ensuring his own medical knowledge is up-to-date, and is eager to develop and adopt new innovations in his work. Mr. Saksena has also been involved in the development of several orthopaedic implants, and uses advanced computer-aided techniques to improve surgical outcomes for his patients.